Having computer checks compatible with your software is essential. Don’t waste time or money. We guarantee our computer checks to be 100% compatible with your software. 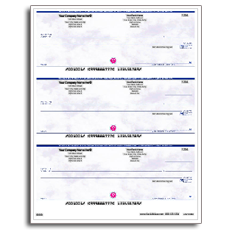 Add your own custom logo design to your business checks or choose from one of our business check stock logos for free! 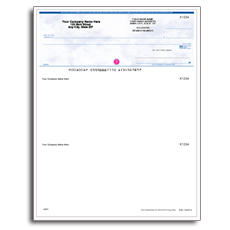 Compatible with many software titles including Quickbooks®, Quicken®, and Microsoft Money®, 3 Per Page checks are the answer when no voucher is needed when issuing a business size check. Also check out our laser check taxi to assist when you have one or two checks left over. Compatible with many softwares including Quickbooks®, Quicken® and Microsoft Money®. Wallet checks are the most popular style for personal use. Wallet checks include a stub on the left for easy record keeping. Don't forget to use our laser check taxis when you have one or two checks left over.